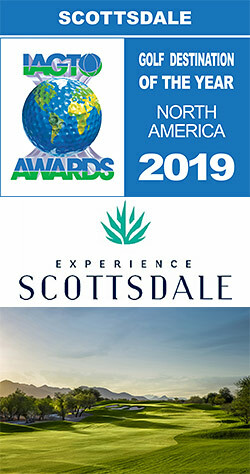 SCOTTSDALE, Ariz. (Oct. 18, 2018) – Scottsdale has been named the North American Golf Destination of the Year for 2019 by the International Association of Golf Tour Operators (IAGTO). With cacti-studded Sonoran Desert landscapes lining courses across the City and 330-plus days of sunshine, Scottsdale ranks as a premier place for both leisurely rounds and championship play. Courses that have graced headlines include TPC Scottsdale Stadium Course, host of the PGA Tour’s Waste Management Phoenix Open, drawing more than 600,000 spectators annually and Troon North Pinnacle Course, named No. 25 on Golf Magazine’s 2016-17 “Top 100 You Can Play in the U.S.” list. IAGTO is the global trade association of the golf tourism industry, comprising 600 golf tour operators from more than 60 countries who cast their vote for this award. Each operator is asked to nominate the best performing golf destinations enjoyed by their clients, resulting in five Golf Destination of the Year winners from each of the five regional categories ― North America, Latin America & Caribbean, Europe, Africa & Gulf States & Indian Ocean, Asia and Australasia. Criteria include customer satisfaction, quality of courses and accommodation, value for money, professional conduct of suppliers, support from local tourism industry and accessibility to tee times. The winners of the 2019 IAGTO Awards were announced Oct. 18, 2018, during the Awards Ceremony of the 21st International Golf Travel Market (IGTM), held at the Ljubljana Exhibition and Convention Center in Slovenia. Scottsdale and golf became synonymous nearly 100 years ago, as visitors chipped and putted from oiled dirt courses under towering Camelback Mountain. Celebrities like Bing Crosby followed shortly thereafter, paving the way for a golden era that heralded golf gods such as Arnold Palmer and Jack Nicklaus. Today, Scottsdale has grown into an urban escape and swung its way into the Golf Hall of Fame with 1,223 holes spread across 51 courses within its city limits, and an additional 156 courses sprinkled across its Valley of the Sun neighbors. When combined with 70 hotels and resorts, 800 restaurants and a year-round median average temperature of 71 degrees, Scottsdale is an unparalleled golf destination. Air travel and a short drive from Phoenix Sky Harbor International Airport make Scottsdale courses easily accessible. Sky Harbor – located just nine miles south of downtown Scottsdale – offers 1,200+ daily flights serving more than 100 domestic and international cities. Find more information about Scottsdale golf and leisure travel at ExperienceScottsdale.com and ExperienceScottsdaleGolf.com. For more information about the IAGTO Awards, visit www.iagto.com/awards.